I was recently asked by a friend to make biscotti for a memorial service for her father. Of course, I was more than happy to do that for her. The only problem was that I had never had biscotti, let alone made it, let alone made it vegan and gluten free and with a reasonable amount of sweetener. I have certainly seen biscotti here and there on periodic visits to coffee shops, but my impression was that it was a dry, maybe slightly bland cookie that one dips in coffee, which I do not drink. Well, how wrong I was! While I still have not tasted a traditional biscotti, I do have a new appreciation for something I am sure is delicious, because I found the alternative sprouted grain, lightly sweet version to be quite yummy. Of course, once I had a few biscotti and the Fall weather started to set in, I wanted to join the crowd and have something to dip it in. Not coffee. No. Yuck. I know you all probably love it, but my parents both drank multiple cups of black coffee per day when I was growing up (still do, as a matter of fact). Much like my first drag on a cigarette at age 8ish (disgusting to let an 8 year old try a cigarette, but it sure did do the trick), my first taste of black coffee completely dispelled any thoughts I ever had of becoming a coffee drinker. For my personal biscotti-dipping pleasure, I visualized a creamy, hot, spicy and totally satisfying drink. Coconut came to mind. And cashews, ginger, cardamom…here is the recipe. Give it a try and see what you think! This recipe makes enough for two, because you should really invite a friend over to enjoy it with you. *chia seeds will thicken up your drink so it’s more creamy. My intuition told me this drink would benefit from them, but I was skeptical, but then pleasantly surprised. They created a nice texture, not a weird one as I was sort of expecting. If you add them then let the drink sit, you may need to add a bit of hot water to thin it down. Put it all in a blender and blend on high until smooth and creamy. I use a Vitamix and don’t find there is any need to strain, but it’s possible you’ll need to strain it if your blender can’t quite get it perfectly smooth. If you have to strain it, throw the pulp in the freezer and put it in cookies or gingerbread or whatever you bake next. If you aren’t a baker, you could add it to hot cereal too. Gently warm your drink in a pot on the stove. Taste; you might not need any sweetener, as the coconut and cashew milk, plus the spices are sweet on their own. If you’d like, add just a bit of something sweet. Enjoy on its own or with a special dipping treat! I was asked to make cupcakes for the birthday party of a sweet little girl who was turning two years old. She cannot eat gluten or dairy and her mom is holding off on introducing her to the world of refined sugar. Just in case, we left nuts out too. She’s fine with eggs, so these cupcakes do contain eggs, though I did a little testing with a vegan version and can offer some notes on that below. The biggest challenge was decorating. I’m a pretty simple girl and I don’t use a lot of the ingredients most pastry chefs would use to make their beautiful, artful desserts, but, of course, we wanted these to be cute and special for the birthday girl and her guests. The next challenge was that I wanted to maintain the integrity of the ingredients and also make a dessert that would please a variety of little palates, including those that might be accustomed to more mainstream desserts. 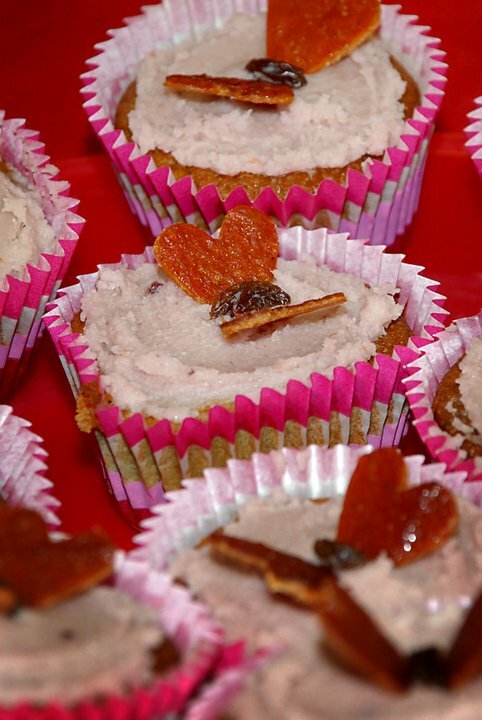 The first challenge was fun – I made a cherry version of these cupcakes with a vanilla frosting that was faintly tinted pink with pureed raspberries. Though I think I could have piped the frosting on with a pastry bag, I decided to hold off on that until I had worked with it more and instead stick to the theme of the party, which was butterflies. I had recently made some fruit leather from the last of my apples and some frozen berries, so I formed 3-D butterfly shapes by using a slice of raisin as the body and fruit leather hearts for each of the wings. When I stuck the bottom points of the hearts into the frosting by the body, voila, I had butterfly wings. Simple, sweet, on-theme, and a healthy and fun decoration that every child could eat! The second challenge was also relatively simple. Truthfully, I find that most children do really well with wholesome, less-sweet treats as long as they aren’t way too different from what they are used to eating. I used a mix of flours that included just a little bit of tapioca and arrowroot starches to keep the taste more neutral and the texture more traditional. You can certainly leave them out and I might on another occasion, but I felt perfectly fine using them for a special treat, especially since the recipe is based mostly on whole, sprouted grain flours. You can, of course, use traditional flours if you don’t have access to sprouted ones. I used agave as a sweetener, but you could also use maple syrup, honey, coconut sugar, or your favorite sweetener. I think these were plenty sweet – appropriate for a birthday treat – but you could cut the sweetener by as much as half if you choose (unless you use coconut sugar which is less sweet than the others, in which case, I would stick with the full amount). I used coconut oil and I would recommend keeping that as is, because it provides a delicious rich taste and a nice mouth feel. If you would prefer not to use eggs, you can use a flax slurry instead (1 Tablespoon ground flax mixed with 1/4 cup of flour = 1 egg). I think I will work with the vegan version a little more, but if you veganize this one, expect a more delicate texture, so you’ll have to be a bit more careful frosting them. *Notes on flours: as I said above, I used sprouted grain flours. Sprouted buckwheat flour is much lighter in color and more neutral in flavor than what you might find at the store, though I think it’s possible to find light buckwheat flour. It’s always helpful to use a mix of gluten free flours because they all have different qualities and can complement each other nicely. In this case, the amaranth flour tends to create moist baked goods, but has a strong flavor quite different from conventional flours. 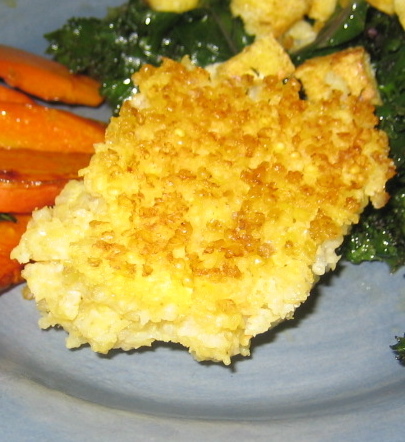 Quinoa flour creates some lightness, but also can have a strong flavor when used on its own. Buckwheat flour is a sturdy flour and, while not related to wheat at all, probably acts more like wheat than any of the other gluten free flours I use. When ground from whole buckwheat, including the hull, the flavor can be strong and the color dark, which works great in some baked goods, but may not work in others. Tapioca flour creates a slight chewiness, or bite. Arrowroot creates a lightness and fluffiness. It can helpful to keep these things in mind when substituting flours or creating your own flour mixes in this or other recipes. Preheat the oven to 400 degrees and oil/line 12-18 muffin tins. Whisk together the dry ingredients in a medium-sized bowl. In a separate, larger bowl, beat the agave, coconut oil, and eggs until very creamy, using a hand mixer or whisk. Beat in the vanilla. Continue to beat/whisk the wet ingredients and add the dry ingredients, about 1/3 at a time. The batter should look silky and should be a pourable, but not watery, consistency; if you life up the whisk/beaters, the surface of the batter should flatten out on its own. If it’s too thick, add a little water, as needed, to get to that consistency. Fold in the applesauce until just incorporated and immediately pour the batter into your prepared muffin tins/papers. Put in the oven and bake at 400 degrees for 5 minutes, then without opening the door, turn heat down to 350 degrees and bake another 10 minutes, or until the muffins are set and evenly browned. When they are done, remove the pans from the oven and let the muffins cool for about 5 minutes in the tin. After they have cooled slightly, remove them from the muffin tin and cool them completely on a cooling rack. Frost and decorate as desired. Enjoy!